Polk Boom Swimmer Jr Bluetooth Waterproof Speaker Brand New, Free shipping. 1x Headphones. What’s in the Box?. Condition: New. Included Cables: 48". Nominal Impedance: 16 ohms. On the right side of the order it will say more actions. You can upload as many as 10 photos (PNG, JPEG, BMP, or GIF; max size 5MB). NEW OPENBOX. PRODUCT IS NEW. Polk BOOM Swimmer DUO Waterproof Bluetooth Speaker (Green/ Speaker Is Orange). Condition is used, but works well Sound Good, includes charging cord, which is a micro USB See pictures for details. 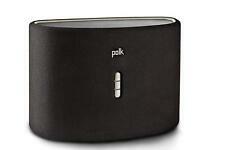 Polk Boom Swimmer Jr Bluetooth Waterproof Speaker (black). Condition is New. Shipped with USPS First Class Package. Ipx7 Waterproof Bluetooth Speaker. Bluetooth Waterproof speaker. Waterproof Polk Boom Swimmer JR. Speaker With Micro Car And Travel Charger. Condition is Seller refurbished. Shipped with USPS First Class Package. Audiophile Sound-Stunning detail, full fidelity and deep bass to maximize performance Active Noise Canceling-Battery-assisted true active noise canceling eliminates the distractions of the outside world (batteries included) Push-To-Hear Ambient Control-Mutes the audio and amplifies outside sounds so you can hear without removing the headphones Ultra Fidelity Dynamic Balance Transducers- Polk's proprietary driver technology guarantees full frequency response while minimizing distortion 3 Button Remote Control & Microphone-Use your iPhone and iPod on the fly with in-line controls Gently used - comes with box and carrying case. Amazing sound!! We will work with you to resolve it in as most satisfactory and efficient manner as possible. Brand new unopened box. Polk Omni S-2 Wireless speaker. All the music you love anywhere in your home. Control what to listen to from your phone, computer, tablet, and stream it wirelessly to any room. Simple set up. Stream from the most popular music services. Small peeling on cardboard box. Wired 3.5 mm plug. Frequency response: 18-23,000Hz. Impedance: 16 ohms. Sensitivity: 118 dB. Includes soft, zippered carrying case and clothing clip. 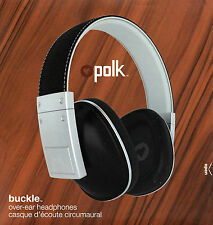 Polk Buckle over-ear headphones. Buckle over-ear headphones are the result of a sweet obsession not only with sound, but with style. We sweated every detail about their physical ­ fit and ­finish, their heft and feel. We are happy to help as well with anything you may need to know. Headphones with 48" cable(121.9cm), in line 3-button remote control & microphone.Cloth Bag.3pairs stayfit silcone ear tips(s/m/L).2 pairs stayfit 3-flange silcone ear tips(s/L).2 pairs memory foam ear tips(s/L) Comfort- ultra supple ear tips for headphones that feel comfortable and sit effortlessly in your ears. Convience- easy to use 3- button control(built in microphone) for phone calls. Sound-Dynamic Balance.5.5 mm drivers performace goals. Wide dynamic range. Noise isolated. Detailed, lifelike sound. The headband uses a lightweight, yet rugged aluminum hinge that enables the headphones to fold down into a compact, easy-travel size. Near Field Communication (NFC) allows for ease and convenience of simply touching your Bluetooth device to pair and connect. Tail can fasten onto objects. Built-in speakerphone. 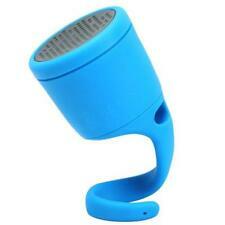 Bluetooth wireless speaker. Speaker phone also. Bluetooth Waterproof speaker. Color Black. With over 40 years of experience crafting quality audio products, Polk has designed an active headphone for music and design lovers alike. The leatherette ear cushions sit comfortably on your ears, so you focus on the music. Legendary Polk Sound. (Brushed cotton & leather travel bag included.). Included Cable 48". Gold-plated 3.5mm precision-machined connector seats more securely into your source connection. Apple Remote: Yes- 3 Button. The BOOM Wrap in-ear headphones include a carrying clip to stick on your bag or keychain — so you'll always have a way to listen. You can also push the button to answer phone calls, too. IN-EAR HEADPHONES WITH. The Polk Omni Utility app provides firmware updates when new features are available. Use your WiFi network to stream music from your phone, tablet or computer with the Free Polk Omni App. Stream Amazon Music, Pandora, Spotify, iHeartRadio, or your own music collection. Bluetooth Water proof Speaker. Speaker Body with Flexible Tail. IPX7 Waterproof 3'/1m. The Urchins interchangeable silicone skins give the Urchin its distinct clean look and also make it shock and water resistant. The Urchins silicone skin is molded with a hole at the top so it can easily be attached to most anything. ITEM: Polk Boom Bit. We never intentionally mislead anyone. There may be other possible unknown, and undiagnosed issues, with said unit, that we did not find in our testing. ABOUT THIS ITEM - THERE IS NO WARRANTY ON THIS ITEM. Moreover, its world-class design combines functional stylewith featherweight comfort to keep you focused on gaming. Striker ZX. Since the founding of Polk in 1972 it’s been our mission to craft high quality,great sounding speakers that everyone can enjoy. Take it to the pool, ocean, and even the shower. Bottom line -- just soak it. Take it to the pool, ocean, and even the shower. Bottom line -- just soak it. It doubles as a support base so you can set it up for great sound just about anywhere. We Have Continually Grown By Providing Quality Deals At Low Prices. This design process refines the drivers even further to improve overall performance balance; you’ll discover a new level of depth and quality in your audio that you never knew existed. With over 40 years of experience crafting quality audio products, Polk has designed an active headphone for music and design lovers alike. Legendary Polk Sound. Polk's proprietary patented Dynamic Balance tuning technology. The Hinge folds up for easy travel. Total Frequency Response: 10Hz-21.5kHz. Serial Number On Box to insure Originality. Bluetooth Water proof Speaker. 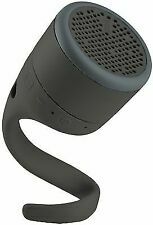 Can be used as a Speakerphone. Speaker Body with Flexible Tail. IPX7 Waterproof 3'/1m. Includes Micro USB Cable. Color: Black.